A Linda Line ship is sinking in the Baltic and our ferry was called to the rescue operation. We’re still waiting in the Tallink terminal, as we will the transferred to another ship. 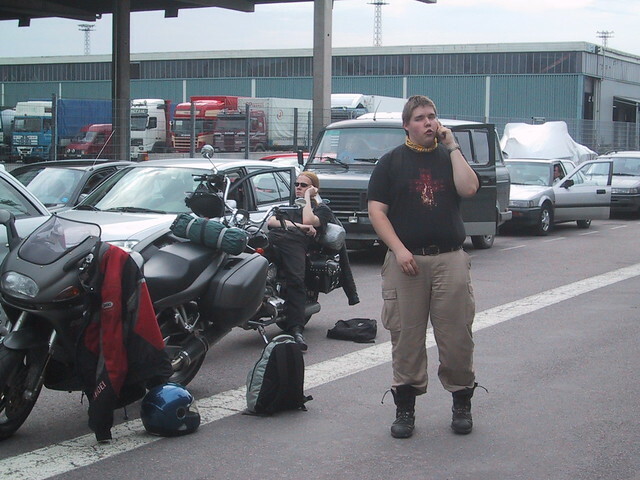 We were not informed of the disaster by the ferry line, but in this age of mobile phones, finding it out was easy. A guy in a car next to us called his friend on the sinking ship, and was told that they were waiting with life vests on and water to their knees. Hopefully the rescue attempt goes well. At least the narrow gulf between Helsinki and Tallinn sees much traffic. In the mean while, we’re trying to figure our ETA for Pärnu. Probably around midnight. Rambo is screwing on the bits and pieces of fairing on his Ducati that were left off during some customization work.